Wednesday, August 12, 1903 I went down town early, stopped at home to do a little stitching. I got trimming for my silk waist this evening and went to the Dr office. Will had stopped at Woolfs. They are shingling their house, I sewed all afternoon. finished my waist. 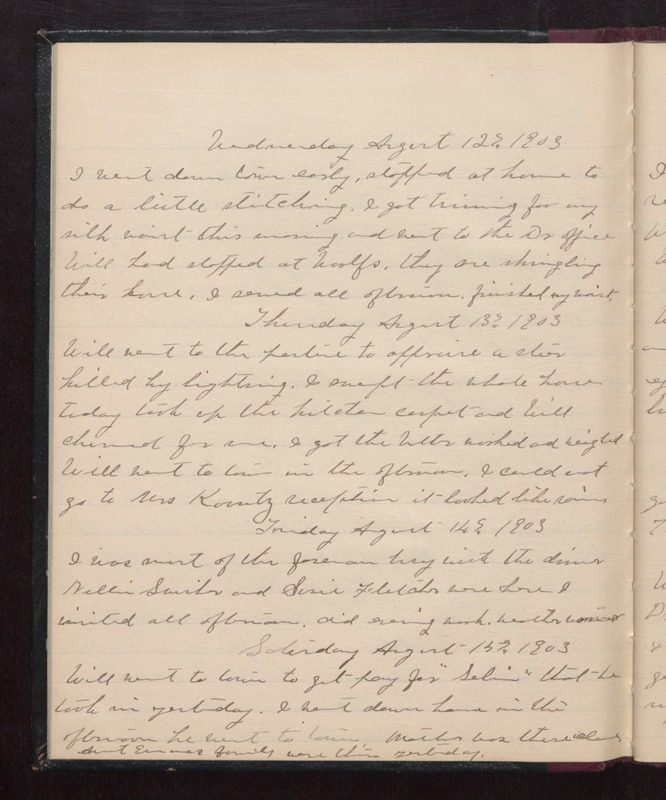 Thursday August 13, 1903 Will went to the pasture to appraise a steer killed by lightning. I swept the whole house today, took up the kitchen carpet and will churned for me. I got the butter worked and weighed. Will went to town in the afternoon. I couldn't go to Mrs Kountz reception it looked like rain. Friday August 14th 1903 I was most of the forenoon busy with the dinner. Nellie Swisher and Susie Fletcher were here. I visited all afternoon, did evening work. weather warmed. Saturday August 15th 1903 Will went to town to get pay for "Seline" that he took in yesterday. I went down home in the afternoon. He went to town. Mother was there [alone?] Aunt Emmas family were there yesterday.